I bought an RV-8 empennage kit back in 1998. Never had time, money, or space to build it, till now. Now that my kids are grown, and I finally have enough room and time to build, I’ve dragged that old tail kit out and started to make a little noise in the garage. My goal is to have an airworthy airplane in 5 years. But, other builders have told me it will take longer. And, once finished I will have to complete a test flight program of at least 25 flight hours in order to satisfy the FAA that my amateur built aircraft is no more likely to fall out of the sky and hurt someone than any other aircraft. The aircraft is built from a series of kits purchased from Van’s aircraft (http://www.vansaircraft.com). I chose to build the Van’s RV-8 because of its all around capabilities. Using a readily available 160hp aircraft engine, its performance far exceeds that of certified aircraft using the same engine. Its traditional construction methods, “match-hole” kit technology, and the excellent builder support through Van’s and an extensive builder network, make it one the most successful kit planes on the market. 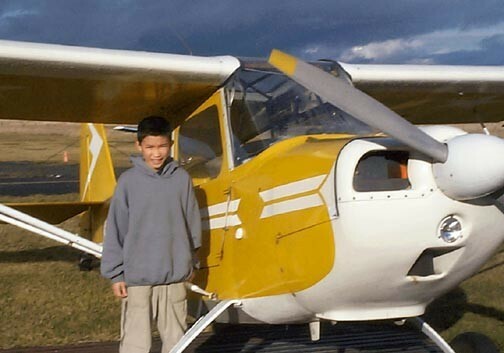 Back when I first thought about building an RV-8, I couldn’t decide on whether I should build a conventional “tail-wheel” airplane, or a Tricycle or “nose-wheel” plane. Shortly after I bought the empennage kit, I got my tail-wheel endorsement in the Navy Flying Club’s Citabria 7ECA. That was such a blast, that the decision suddenly became very easy for me. Steven getting ready to co-pilot the flying club’s Citabria in 1999. The “cool” factor, and what I consider to be the more aesthetically pleasing stance of the tail-wheel especially with the (taller Grove airfoil main landing gear legs) are a big part of it. But also, the tail-wheel version does have just a little bit more ground clearance under the propeller in the 3-point attitude, a definite advantage in getting into unimproved airstrips. The trick will be in learning how to make good 3-point landings. It seems most RV pilots would rather make “wheel-landings” at faster speeds. I remember when I got my demo ride with Ken Scott at Van’s, in the companies RV-6A demonstrator. This was before Van’s Aircraft moved to their current location. I watched as he flew that bird down to a perfect 3-point landing onto Van’s little grass strip to what was one of the gentlest touchdowns I can remember. This discrepancy between what I saw on the demo ride, vs. what I hear other RV-7/8 pilots describe as the birds’ quirkiness on short final to a 3-point landing is something I will have to figure out for myself. Check back often. This page is still a work-in-progress!